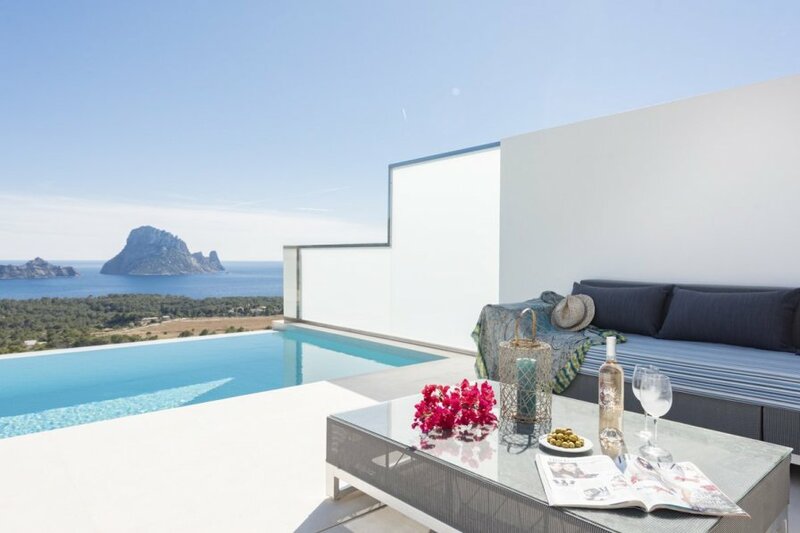 Villa Lusco is a vibrant, luminous and sleek holiday home offering stunning coastal views over the sea and islands of Es Vedra and Vedranel. This home offers the final word in understated luxury: sleek, minimalist design and a clean, unadorned aesthetic is the tone of the day. Dazzling, whitewashed exteriors, glistening pool and slick, postmodernist outdoor spaces finished with glass balustrades, and decking creates a stylish, decadent and luxurious home. Finished with designer verve and charisma, this home infuses the light and colours of its surroundings, within the most simple aesthetic, yet executed with unparalleled quality. Decadence meets simplicity at Villa Lusco! The modernist architecture creates an alluring sight, nestled in the hills, overlooking the coastal cliffs. Indoor and outdoor living blend seamlessly in this home - there are ample day beds and loungers scattered across the layers of veranda and sun deck spaces, which lead through the floor to ceiling, large glass panel into the open plan living area. High ceilings, chic and bold furnishings within the most tranquil and airy space create such a therapeutic atmosphere. A sense of playful holiday youthfulness is retained: funky artwork and accents of zingy, citrus tones against a palette of soft neutrals. The living-dining space is impeccably finished; both characterful yet achingly cool, it offers ample space for the group or family to spread out and relax. The sumptuous corner sofa and abundant glass looking out over the sea views, while dining is a friendly affair. Hints of traditional raw materials give this place character and charm; marble, stone, exposed brick alongside the most contemporary of minimalist architecture, while bold interiors choices give this place a hint of rock and roll edge! Seven guests can be seated at the dining table, with its sleek monochrome palette - this space flows naturally from living area to the kitchen. The kitchen is light, bright and executed with impeccable quality. Glossy, cream, minimalist surfaces - top range fittings and appliances; breakfast bar finished with natural, local stone; Villa Lusco is a stylish home. Effortlessly tasteful, yet cosy all the same, the living space offers open plan living at its very best; subdivided very naturally, yet with a wonderfully open, airiness. The abundance of glass, far-reaching island views and natural progression into outdoor spaces extend the sense of area and volume. Six guests can be accommodated across three double bedrooms. The bedrooms offer unique tranquillity. Splashes of bright colour, set within such restorative spaces provide the ultimate resting space, finished with quality cotton bedlinen and a neutral palette. The bathrooms are seductively chic; black, glossy marble and enormous walk-in showers create a designer's paradise. For a home that is unapologetically decadent; sensual and glamorous very much in keeping with the Ibizan spirit, with interiors that are unique and outdoor spaces which make leaving the villa an unnecessary effort, Villa Lusco ticks every box, again and again - a home that will make guests smile, and certainly return! Villa Lusco is nestled in Cala Carbo, just two minutes from the beach, and only a further five minutes from the shores of Cala d'Hort and Cala Vadella. A mere seven-kilometre drive will take guests to the village of San Jose, and twenty-five kilometres to Ibiza city.